Planning a trip to Greece can be fairly straightforward. But there are always those things that you you really wish you'd known earlier (especially if you've ever encountered different type of toilet while abroad). So here are a few practical, cultural, and surprising tips to help you get around Greece. Greeks speak Greek. But since all schoolchildren start learning English in the third grade, most Greeks under 40 will also know English. Those in the tourist industry, especially in the locations favored by foreign tourists, usually have a good command of English as well as a few other languages. The language barrier will not be a big problem for you on your trip, and if you learn the letters of the Greek alphabet you'll be one step ahead. 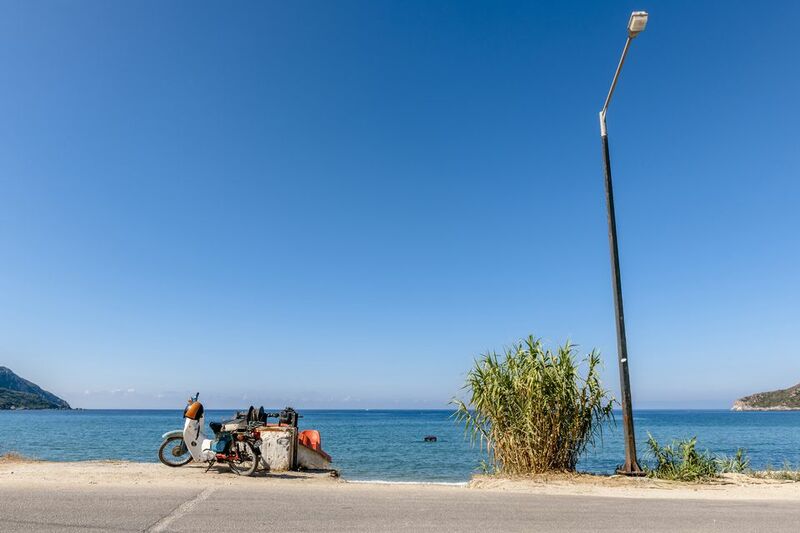 Little compares to the sense of freedom that renting a motorcycle or motor scooter can give you on your trip to Greece. However, wild and curvy roads, uneven surfaces, slow-moving farm vehicles, and fast-driving Greeks can also make this a highly dangerous activity. Wear the helmet and keep alert; even ​driving in Greece is challenging. Greek plumbing has seemingly gone downhill since Minoan times when flush toilets were developed in about 2000 BCE. The modern Greek plumbing system is (or believes itself to be) incapable of handling toilet paper. Yes, you read that right. The Greek method is to do your business in the toilet but to put the paper in the wastebasket located nearby. This sounds far worse than it is in practice, but it is still unnerving for many travelers used to flushing toilet paper down, um, the toilet. If you forget, don't fish it out, but for the sake of your hotel keeper or restaurateur, try to remember to throw it in the wastebasket. The quirky toilet doesn't end there. Sometimes it will take detective skills to figure out how to flush it. If you are traveling off the beaten path, it may be a button, a pull chain, a button on an elevated tank, a standard flush, a foot-pedal flush, or many other variants. Most modern toilets have a roughly oblong double-button area. This is actually a green device which allows you to select a "big flush" or a "little flush" depending on the need. Time is relative in Greece even when it comes to buses, trains, hydrofoils, and ferries. While everyone more or less expects that such things can run late in normal circumstances, they can also run early in Greece. Sometimes there's a good reason like a hydrofoil leaving a few minutes early because the weather is changing and they want to make it to the next port as quickly as possible. If you are one of those people who always get everywhere early "just in case," you may find that a valuable trait in Greece. But it will be more than offset by an approximately equal number of times that the vehicle in question is running late. It's easy to put a less-than-welcoming expression on your face when that last sweaty person you've been apparently waiting for the past ten minutes finally approaches the gate. But the truth is, that poor person has just been through airport hell through no fault of their own. They have innocently been put on stand-by and then delayed until almost the time of departure when a gate agent suddenly generates their documents with a flourish, pushes them into their hand, and says "Go! Go! The plane is about to leave!" They send the innocent victim racing through the airport, through security, and finally into the last sprint to the gate bus and all those scowling faces—usually while ominous announcements over the loudspeaker are impatiently requesting their immediate presence at the gate by name. Making this situation worse, the airline may not have been compassionately waiting for a previously-booked client to show up at all. In Greece, some short-hop planes heading for islands with short runways literally don't know how many passengers they will take until they've calculated the luggage weight. In that case, the luggage crew generates another last-minute "Yes! We have room!" message and launches all the flurry described above. Athens is one of the safest world capitals, but does that mean perfectly safe? Not quite. Pickpockets, in particular, seem to be getting more and more active, but a little caution can go a long way in keeping your vacation safe. There are ways to minimize the threat of having your pocket picked. Everyone should carry their valuables close to them. An option is to carry valuables, including your passport, in a sturdy, below-the-belt security wallet. Men should never carry a wallet in a back pocket. Keep your valuables hidden.